The bedroom is one of the most private and personal spaces in the home which can be enjoyed as a peaceful area to recharge or an anytime retreat. Embellishing your bedroom in a look that you love can make all the difference to how you feel when you spend time in the environment. And if you already love making the most of this room then some interior changes could go a long way to making it even more enjoyable. Have a gander at our bedroom design ideas below which can help you totally revamp or simply refresh your night cave. Your bedroom is a space to feel cosy and one of the best ways to capture this vibe is with texture. Introduce a combination of materials including wicker, cotton, canvas, fur and velvet to inspire a comforting look that has an interesting sense of depth. Don’t forget to add a throw and plenty of cushions for cuddling. As mirrors reflect light and lift surface colours, they can make a bedroom feel big and beautiful. Place a couple of mirrors on separate walls to enhance the room’s airy feel and generate a more pleasant environment. The combination of a full length and decorative feature mirror can work nicely. White walls are always a good idea because of the flexibility they provide. While the neutral colour can make a space feel bright and open, it also gives a blank canvas that can be paired with almost any decor theme. The key with white walls is to introduce all the interest in the furniture and accessories. Decorate with the items you love and change-up the feel whenever you fancy. The bedroom is usually one of the smaller rooms in the home so it’s worth taking care not to make it look any smaller. 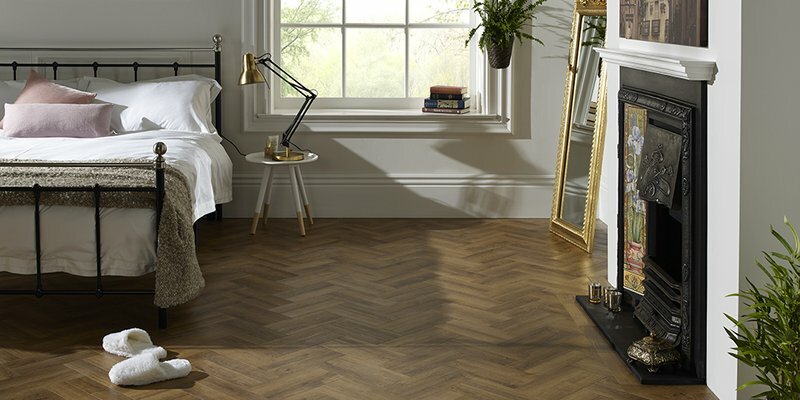 And as flooring is one of the largest surfaces in any bedroom, it can make a big difference to the size a space feels. To ensure your bedroom isn’t closed-in, avoid dark or rich floor colours. Instead, opt for light or mid-toned shades that can enthuse a sense of open space. Check out Oak Tradition, White Planed Oak, Limed Oak for some starter ideas. As the bed is usually one of the largest pieces of furniture in a bedroom, it can have a big impact on the overall look. Yet what this also means is that the style of a bedroom can be quickly changed with something as simple as a new duvet cover and some cushions. Just ensure that your choice of bedding is in-keeping with the colours and theme of your room. Only opt for patterned bedding if your look is fairly minimal and go for a simple pinstripe or plain colour if your style is bold. Framed prints on one or more of the walls can bring a really relaxed feel to your space along with lots of interest. Choose frame colours that contrast with your paint shades and hang them in random layouts. Include photographs of memories that you love to make your bedroom feel personal. As the bedroom is one of the most intimate spaces in the home, it makes sense for it to represent an extension of your personality. Add your personal touch with objects that you enjoy along with décor that reflects your lifestyle. A beachy theme could capture your love of travelling and the outdoors whereas a fresh, floral vibe is a great way to express femininity. If you’re crafty and enjoy creating anything from drawings to pottery or picture frames them look to find a place for crafts in your bedroom too. The traditional idea of decorating a bedroom focuses on everything matching, from bedroom furniture to the bedding and curtains. Yet, today’s décor doesn’t quite follow the same rules and for good reason. Mixing up styles can create a much more relaxed feel – exactly the type of vibe that makes sense for a bedroom. Choosing a look that’s free from restriction will ensure the room is less defined by its furnishings than by its overall chilled-out feel. Some ideas are to pair a wire bed frame with wooden nightstands. Different patterns in the curtains and bedding can also be refreshing. Houseplants are fit for any room in the home so introduce them to your bedroom too. They can evoke a lovely sense of the outdoors and just make the vibe feel a little more fresh. Choose from fresh flowers, leafy greens or cacti – these little beauties can bring cheer to your space on any day, regardless of the weather. If you have the space, try to include seating in your bedroom. While this gives you somewhere to read and relax other than your bed, a seat can also make the room feel more rounded and versatile. For more bedroom design ideas and inspiration for all rooms in your home, head to our Pinterest page.